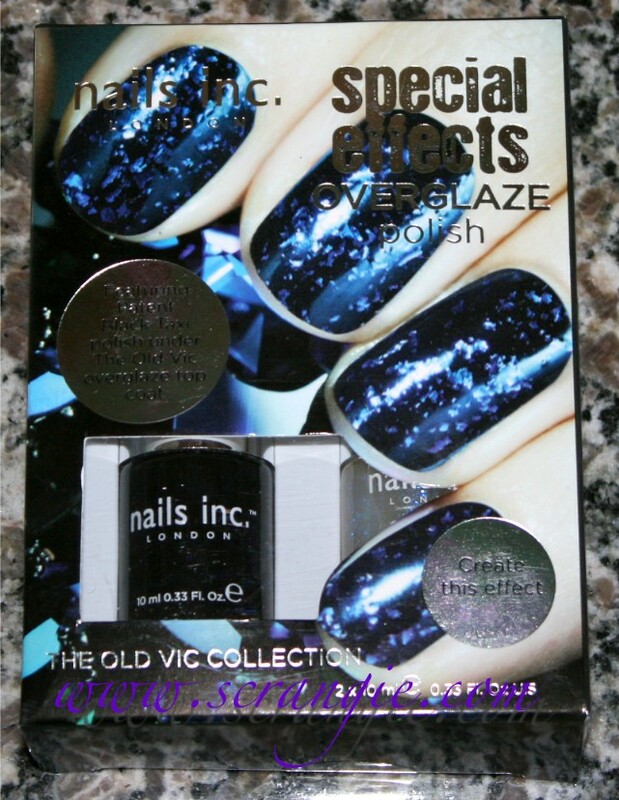 The Old Vic Collection is one of three new Nails Inc. Special Effects Overglaze polish duos now available at Sephora. 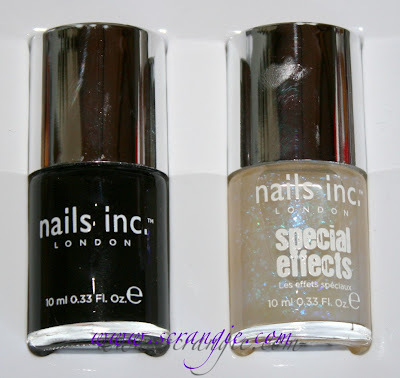 These are the same as the Nails Inc. Gossip Girl duos released in the UK; The Old Vic is the same as The Serena Collection. The duo is packaged in its own special packaging that shows the finished nail look. It's a small touch, but I appreciate it. The back of the package has some suggestions for use, including a recommendation to use the flaky topcoat over white, which is one of my favorite things to do with flaky topcoats. The set contains two full-sized bottles of Nails Inc. polish. One bottle of Black Taxi, which is a black creme, and a bottle of The Old Vic Special Effects overglaze polish, which is clear with blue/purple flakes. 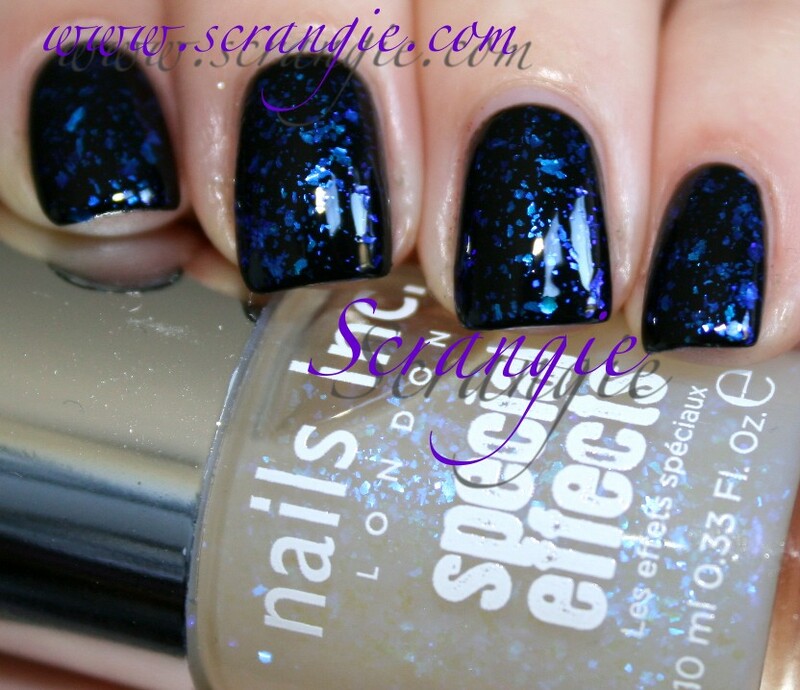 Nails Inc. Black Taxi. This is just your run of the mill black polish. It's not the best I've ever used, but it's not the worst, either. It's a two-coater and takes a little longer to dry than I had expected it to. Nails Inc. Special Effects Overglaze in The Old Vic. 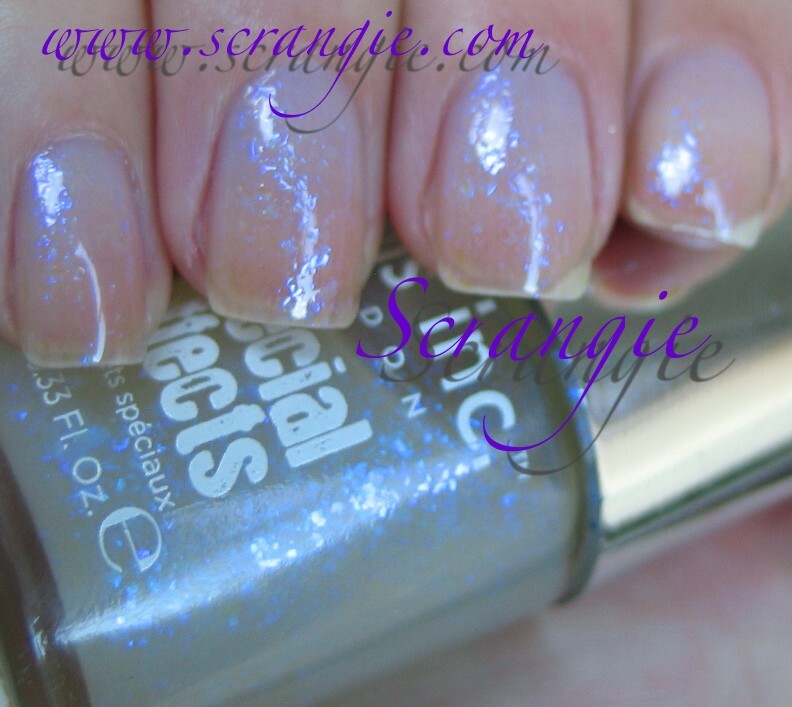 This is a clear base with tiny, irregular shaped pieces of clear blue/purple/slight turquoise duochrome flake glitter. The flakes in this are more subtle looking than other colors of flakes, like the red/green/yellow type of flakes in Essie Shine of the Times / Sally Hansen Hidden Treasure / Nubar 2010, et cetera. They're smaller and they're not as strongly colored. I think they look pretty cool by themselves, I'm wearing two coats here. Nails Inc. 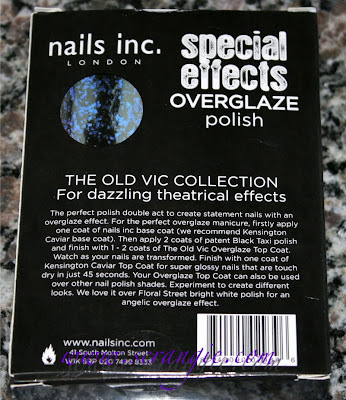 The Old Vic Special Effects Overglaze over Nails Inc. Black Taxi. Two coats of each. See how the flakes in The Old Vic are pretty subtle, even at two coats? They're visible, they're just small and not as boldly colored. 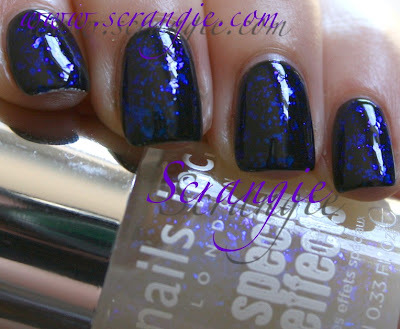 I mean, the color of them is bright, but it's not as bold or strong or noticeable as other types of 'flakie' topcoats. Note the slight purple duochrome. The formula on these was just okay. Black Taxi was runnier than I expected it to be, but not troublesome. The Old Vic had a little bit of a runny texture, too. They didn't feel like any of my other Nails Inc. polishes, but they weren't bad. The truly bad thing about them is the dry time. These seemed to take forever to dry and when I wore them together I could still dent the polish after four hours. This has not happened with any other Nails Inc. polish I've worn. I don't know why, but the formula of these two doesn't seem like normal Nails Inc. formula. 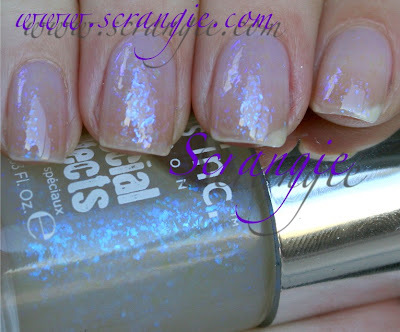 As much as I love flaky polishes, I'm not overly impressed with this one. The flakes are really sparse and the dry time is too long. If the dry time was better, I wouldn't have any qualms about buying another one of these. These Nails Inc flaky topcoats are only available in the duo packages at Sephora, and the duos are $20 each. Slightly more expensive than buying two Nails Inc. polishes separately. I'd prefer to be able to buy the Special Effects overglazes individually, so hopefully that will be an option in the future. I got mine at Sephora. Side note: The descriptions for these sets are sort of mixed up on Sephora's website; this one lists The Wyndham topcoat and Kensington polish, but it actually has The Old Vic and Black Taxi. I like this duo! 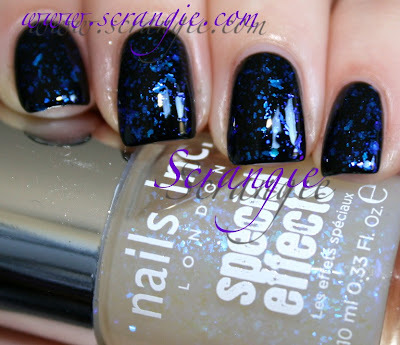 Too bad about the dry time though :( Sephora seems to have all of the Nails Inc. sets mixed up! I like this duo. I have the other two but I think I would like this one the best! I really wanted to get this b/c I've been looking for a true blue flakey! Too bad about the dry time. Did using a quick dry top coat help? Any other suggestions for a true blue flake? I, too, really wish they'd sell the topcoats separately. Or even the set of all three flakies together for slightly more than their usual per-bottle prices. I have plenty of stuff to put them over, and I don't need an undersized ten-dollar bottle of runny black polish. I love the way this looks, reminds me of poison dart frogs! Oh I love that! I really like the style of glitter, I'm gonna have to buy these aren't I? I ordered the Blair version - I seriously hope it turns out okay! I love the colours but dentable nails after 4 hours? OUCH. Excellent honest review as usual! I LOVE the look! It's so unique and cute. Thanks! 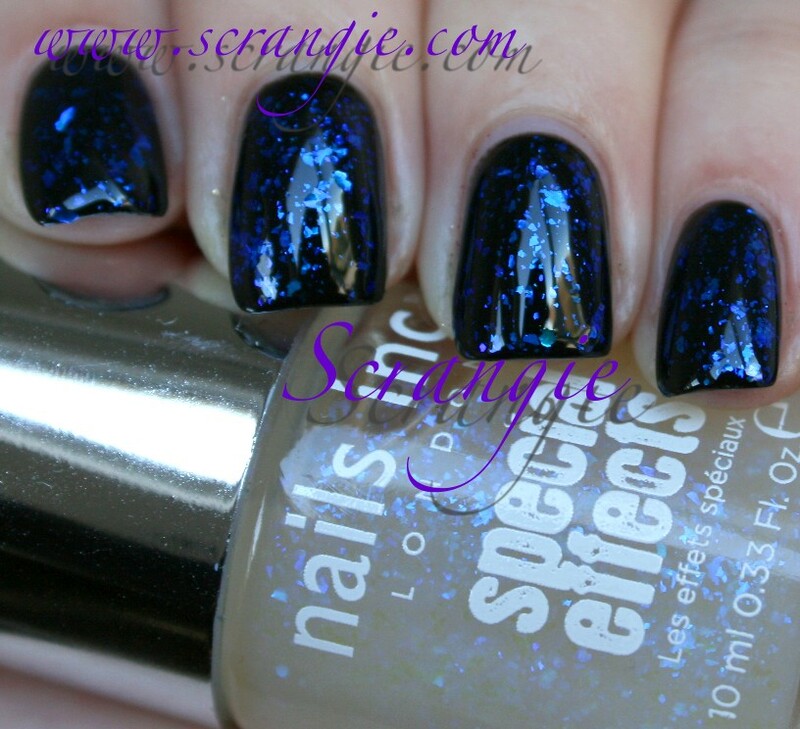 When my friend and I checked out Nails Inc. at Sephora, we really liked the flakies, but wished that they were sold separately. I think that most people would agree - you don't need another black polish unless it's really different. I'm shocked that even after so many hours, you could still dent the polish. I wanted this flakie before, but...now, not so much. It looks gorgeous on your nails, Scrangie, but...when it comes to nail polish, I don't have patience to wait for it to dry. Thanks for your review and pretty photos! Darn, if it wasn't for the dry time, I would totally use my gift card on this.